Dozens of Israeli settlers stormed Friday Kafrit village southwest of Jenin and Beit Furik town in Nablus under military protection. Local sources affirmed that dozens of settlers stormed Kafrit area in Jenin and performed Talmudic rituals while chanting anti-Arab slogans in total provocation to the local residents. Along the same line, hundreds of settlers stormed Beit Furik town in Nablus and carried out a series of provocative acts. 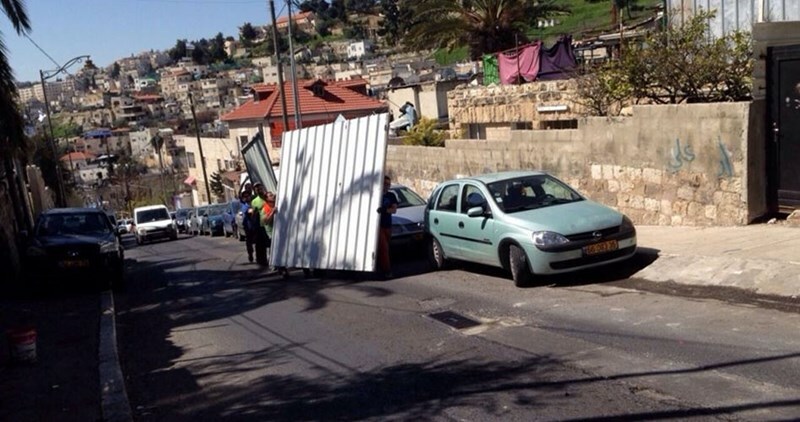 The settlers stormed the town in military jeeps and motorcycles, eyewitnesses said. Despite living under a brutal military occupation, Palestinian towns and villages located near illegal Israeli settlements are subjected to regular settlers’ attacks and violations under the protection of Israeli forces. 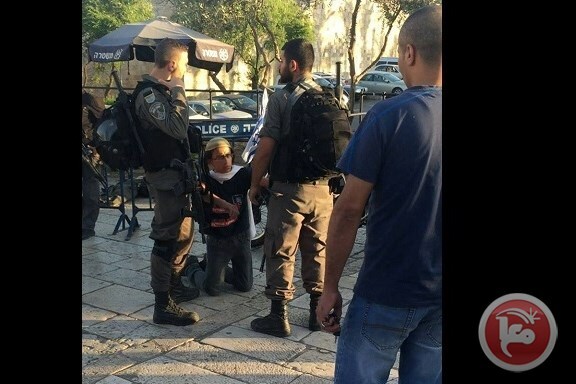 Israeli border police arrested 10 right-wing Israelis Thursday evening after they assaulted Palestinian residents of Jerusalem at the Damascus Gate entrance to occupied East Jerusalem’s Old City. She added that three of the ten arrested were women carrying their infant children. Tensions in the Old City contributed to the recent escalation of violence after right-wing Israelis made frequent visits to the Al-Aqsa Mosque compound during a succession of Jewish holidays last fall, as the mosque sits where Jews believe the First and Second Temples once stood; extremists call for the destruction of the mosque to make room for a Third Temple. Dozens of Israeli settlers gathered at noon Thursday near the Hawara roadblock, south of Nablus, and started performing Talmudic rituals in the middle of the street. Meanwhile, eyewitnesses said that Israeli occupation soldiers closed the main Nablus-Ramallah highway without any known reason. They added that hundreds of Palestinian vehicles were waiting on both sides of the barrier waiting for permission to pass through. Israeli settlers stepped up overnight their attacks against Palestinians and their properties as they were celebrating their Jewish holidays. In al-Khalil, a group of settlers stoned late yesterday several Palestinian homes in the Old City. 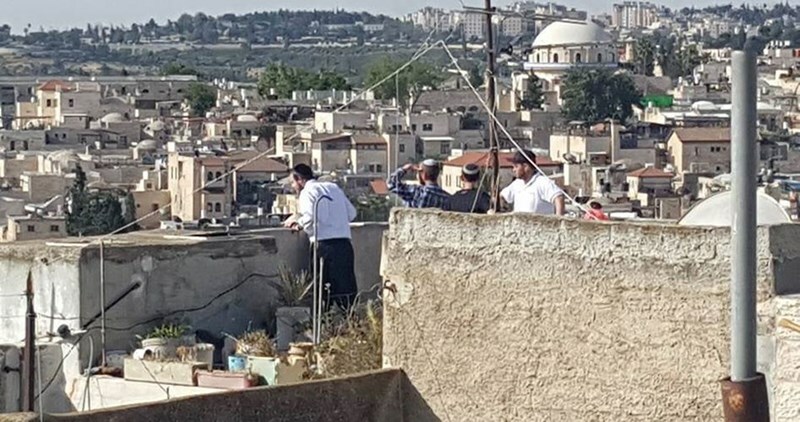 The settlers threw stones and empty bottles at a number of local homes after they performed Talmudic rituals at the Ibrahimi Mosque, the PIC reporter affirmed. Following the settlers’ attack, clashes erupted in the area during which several local youths were injured. 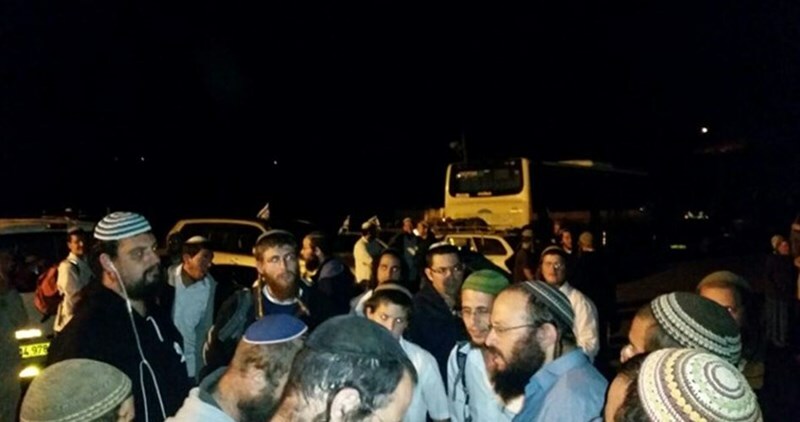 On the other hand, hundreds of settlers closed all roads leading to the evacuated settlements of Sanur and Homesh north of occupied West Bank and performed Talmudic rituals in the area. Sanur and Homesh settlements were evacuated in 2005 and returned to their Palestinian owners amid a rise in attempts by Israeli settlers to wrest back control of the lands. Jewish organizations Tuesday called for raising the Israeli flag over the Dome of the Rock at the Aqsa Mosque during the commemoration of the Palestine Nakba in 1948 which coincides on May 15. The organizations concerned with what has been known as “calling for building Temple of Solomon” published posters on social media networking and electronic websites demonstrating a Jewish settler over the Dome of the Rock while raising the Israeli flag. In a similar context, Hebrew Yedioth Ahronoth newspaper stated that Israeli Minister of Culture and Sports Miri Regev works on setting a new law that obligates all institutions funded by the Israeli government to raise the Israeli flag including sports stadiums, theaters, and public halls. 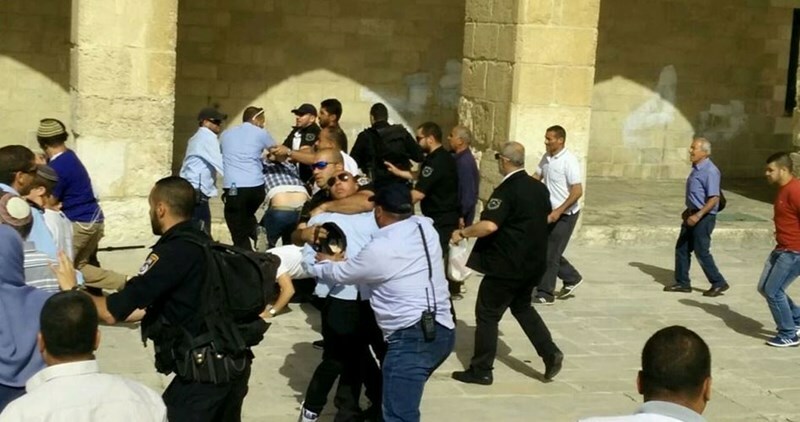 A group of Israeli settlers led by the extremist Israeli rabbi Yehuda Glick stormed al-Aqsa Mosque via the Israeli-controlled al-Magharibah gate, early Tuesday. 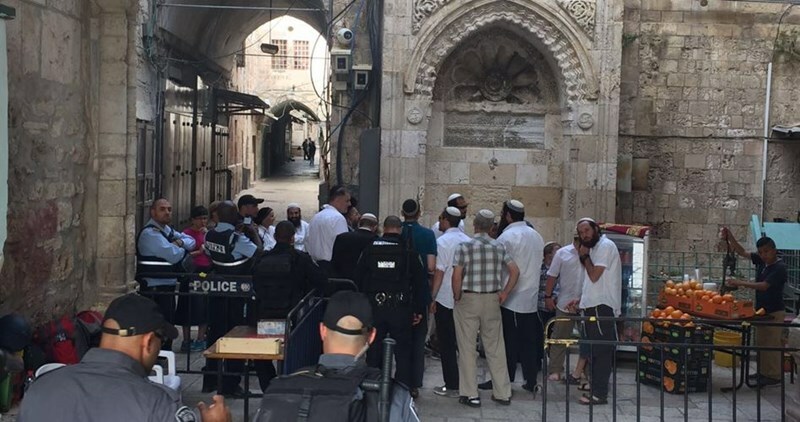 The extremist rabbi and the settlers broke into the compound under tight protection by Israeli Special Forces, in total provocation to Palestinian worshipers who started shouting Takbeer protesting at the settlers’ daily break-ins into the holy shrine. A number of the settlers group tried to perform Talmudic rituals in the compound before being prevented by the worshipers. Israeli police, stationed at the Mosque’s main gates, imposed tight measures on Palestinian women’s access to the holy Islamic shrine. Al-Aqsa Mosque witnesses, almost daily, incursions and violations by Israeli settlers and extremists, amid tight Israeli restrictions imposed on the entry of Palestinian worshipers. 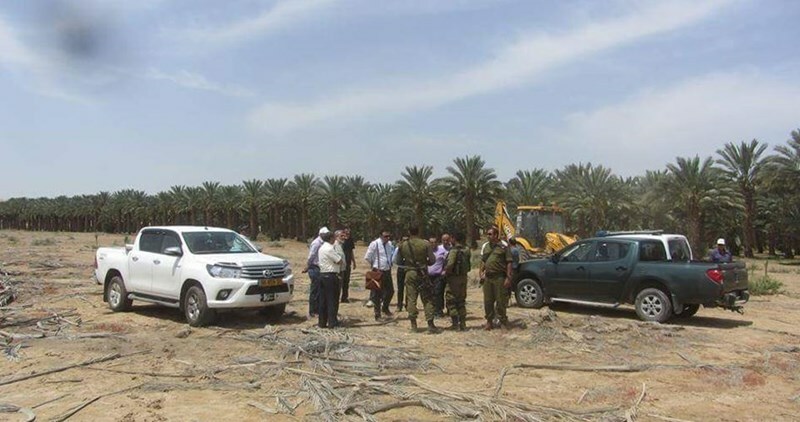 Israeli settlers and soldiers on Monday prevented Palestinians from planting palm trees on land belonging to the Palestinian Waqf Authority in al-Auja town, north of Jericho city. 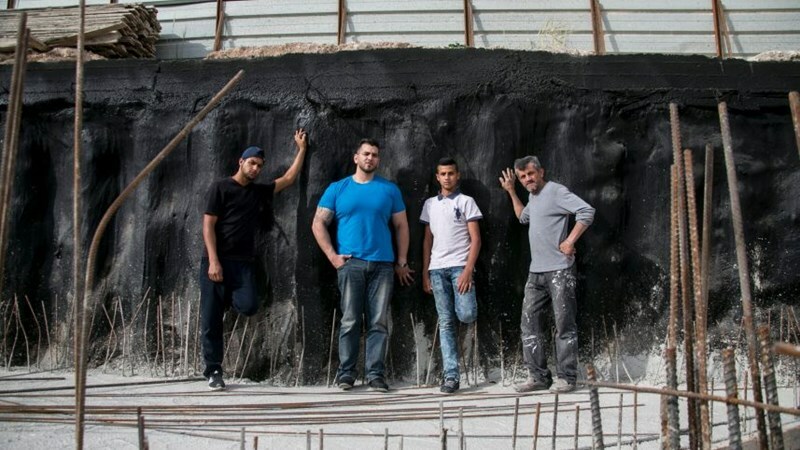 Quds Press quoted local sources as saying that settlers escorted by soldiers and employees from the civil administration of the Israeli army prevented Palestinians working for Sultan Company from planting palm trees on its leased land. The land, which is about 650 dunums in size, originally belongs to the Palestinian Waqf Authority, which leased it to Sultan Company. Israeli settlers took over at dawn Monday a big Palestinian home belonging to Elyousbashi Jerusalemite family in al-Saadiya neighborhood in the Old City of Occupied Jerusalem. Activist Alaa al-Haddad, one of the Old City’s inhabitants, told the PIC reporter that 40 settlers broke into the home and performed Talmudic rituals in its yard. He added that the house is a huge property consisting of three levels and overlooking the Aqsa Mosque. The family members were not at home at the moment of the settlers' incursion, he pointed out. Israeli authorities confiscated a land from a Jerusalemite family, then handed it over to Amana, an organization that works to establish settlements and outposts, Haaretz Hebrew newspaper revealed Monday. Documents submitted by the family for an administrative petition against the land transfer reveals that the state used strenuous bureaucratic acrobatics to deliver land that didn’t belong to it. The plan was prepared and approved without the family knowing of the expropriation. The property map was redrawn to legitimize the expropriations, and related documents were hidden from the owners, Haaretz added. However, the Israeli District Court rejected the Palestinian family’s petition, which is being appealed to the Supreme Court. Amana, founded by the Gush Emunim religious settlement movement in 1979, is the most important private body for establishing and expanding West Bank settlements. The company made headlines last month after two of its executives, secretary general Zeev Hever and treasurer Moshe Yogev, were investigated over alleged corruption. The company owns Al-Watan, which has been repeatedly involved in deals buying land from Palestinian owners that turned out to be forged. These areas included land belonging to the Abu Ta’ah family, a Palestinian family from Lifta that now resides in occupied Jerusalem. Over the years, the Abu Ta’ah family tended to the plot and occasionally rented it out. Meanwhile, steps were taken secretly that led to its expropriation for Amana’s benefit. 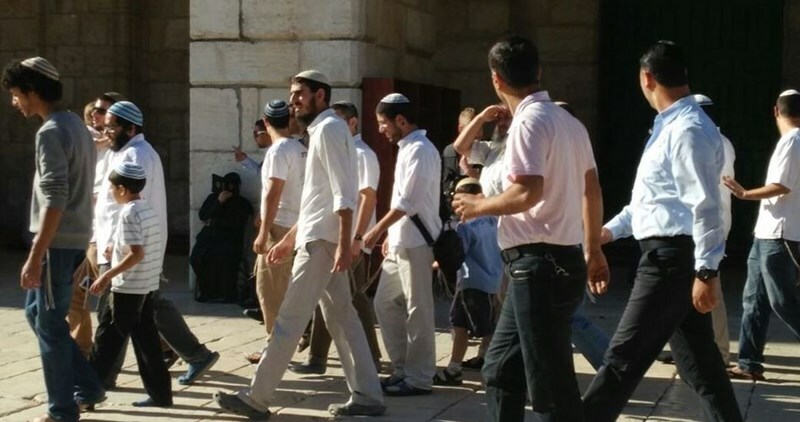 Dozens of extremist Jewish settlers on Sunday evening participated in a march near the Aqsa Mosque calling for building the alleged temple of Solomon. Their march took place a few hours after they toured under police protection the Aqsa Mosque's courtyards. 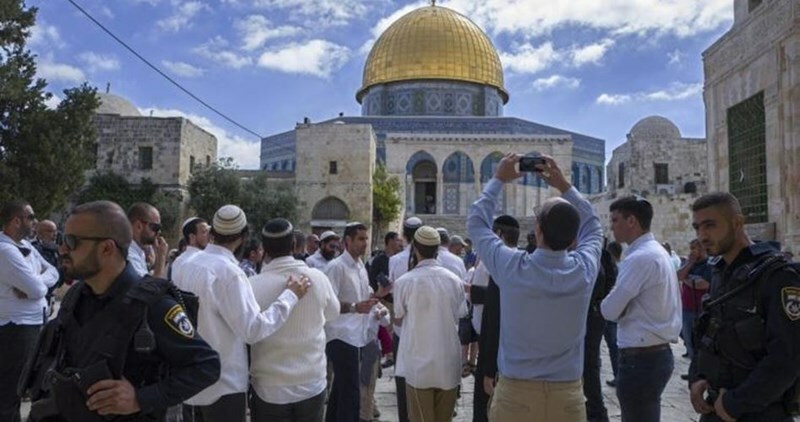 According to the Jerusalem Media Center, the settlers marched in the Old City of Jerusalem and near the Aqsa Mosque while chanting slogans demanding the building of Solomon temple in place of the Aqsa Mosque. During their march, the Israeli police blocked the road near al-Asbat Gate area and prevented the Palestinians from using it for a while. For his part, senior official of the Islamic Waqf authority in Jerusalem Firas al-Debs said that the same group of settlers performed some rituals during their desecration of the Aqsa Mosque's courtyards, which provoked Muslim worshipers there into chanting religious slogans in protest at their entry to the Islamic holy shrine. A new video published by the Israeli Information Center for Human Rights in the Occupied Territories shows a Palestinian videographer assaulted by Israeli settlers, causing head injuries, while Israeli soldiers watched, doing nothing to intervene. A press release from B’TSelem about the incident reads as follows: On 4 May 2016, at around 5:00 PM, Raed Abu a-Rmeileh, 42, Saher Jaber, 23 and Abd a-Razeq a-Salaymeh, 48, were making their way home after having closed their stalls in the Hebron market. to the ‘Abed checkpoint, near al-Haram al-Ibrahimi (the Tomb of the Patriarchs), they came across three settlers who had a dog with them, and used it to scare two Palestinian girls who were walking on the street. Raed Abu a-Rmeileh, a former volunteer with B’Tselem’s camera project, lifted his camera to document the settlers’ actions. In response, the settlers attacked him and his friend even before he began filming. One of the settlers hit Abu a-Rmeileh hard on the head with an unopened drink can. He fell to the ground. Filmed by Raed Abu a-Rmeileh and passersby, after Raed Abu a-Rmeileh was injured The settlers also attacked Abu a-Rmeileh’s friends, who fled into the grounds of the nearby al-Ibrahimiya school. 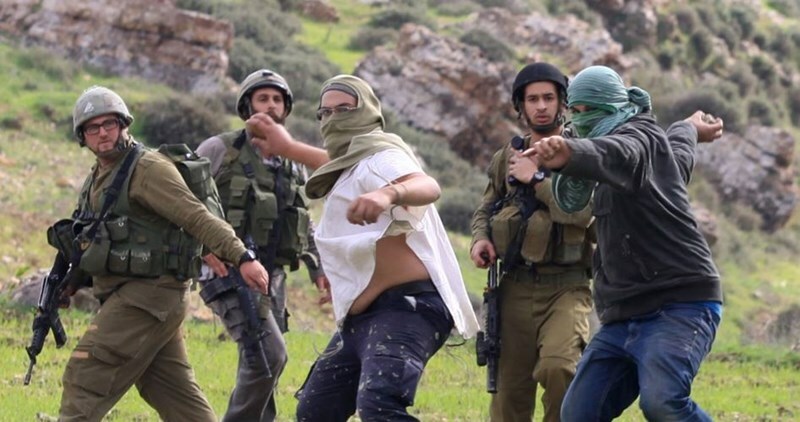 Soldiers were present throughout the incident, but did nothing to stop the attack, arrest the settlers or help Abu a-Rmeileh, who was injured in the head. When Saher and Abd a-Razeq returned to the scene, Abu a-Rmeileh was still on the ground, holding his head, sighing in pain and nearly unconscious. Saher called the Red Crescent and tried to care for Raed along with Abd a-Razeq and other people who were present at the scene. Some 15 minutes later, more soldiers arrived, as well as police and border police officers and a Red Crescent ambulance that evacuated Abu a-Rmeileh to ‘Aliya Hospital. Abu a-Rmeileh sustained light head injuries and suffered from headaches. He was admitted to hospital overnight and released this afternoon. After his release from hospital, Abu a-Rmeileh was summoned to the Kiryat Arba police station where he filed a complaint and gave the police the footage. The officers showed him some photos, and he identified his assailants. 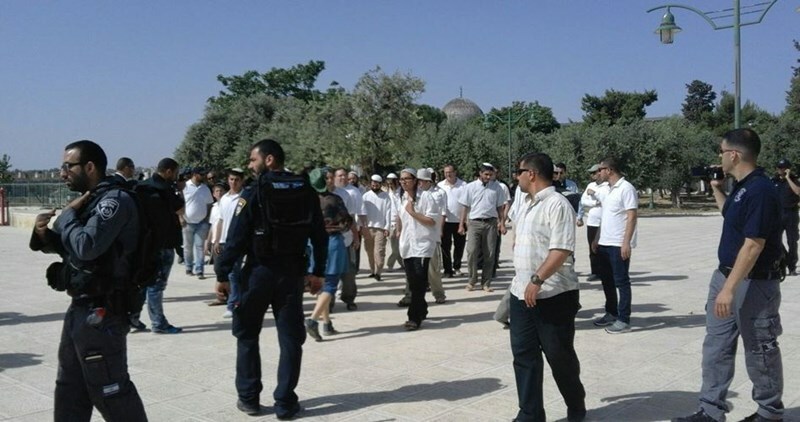 Dozens of Israeli settlers stormed Sunday morning al-Aqsa Mosque from the Israeli-controlled al-Magharibeh Gate, Quds Press said. 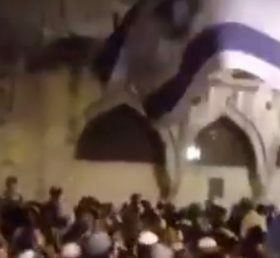 Nearly 20 Israeli policemen and 70 Israeli settlers stormed the Mosque and roamed throughout its squares under heavy Special Forces’ protection in total provocation to Palestinian worshipers who started shouting Takbeer in protest against the settlers’ presence in their holy shrine. Meanwhile, Israeli police prevented a Jerusalemite citizen from having access into the Mosque and summoned him for investigation for unknown reasons. He was earlier held under house arrest for a week and prevented from entering into the Mosque for 15 days. 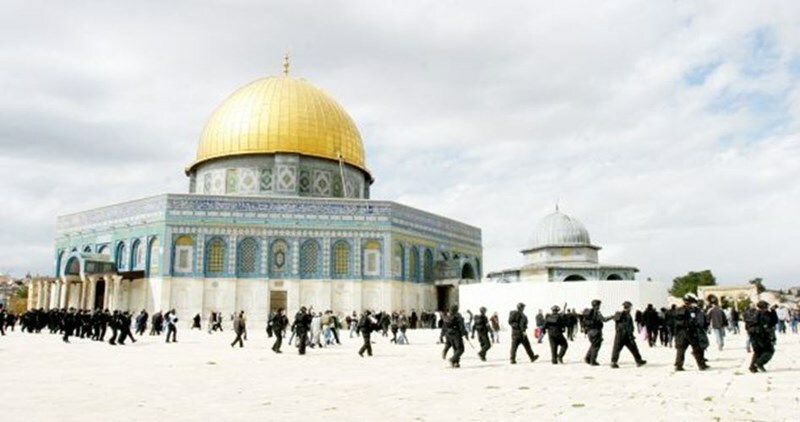 Quds Press earlier reported that almost 1,868 Israeli settlers stormed al-Aqsa Mosque during April 2016, pointing out that Israeli provocative break-ins into the holy shrine have notably escalated during the Passover Holiday. A horde of Jewish settlers on Saturday physically assaulted two Palestinian human rights activists as they were documenting their violations against local residents in Tel Rumeida neighborhood in al-Khalil city. A video recording released by Human Rights Defenders has showed a group of settlers and their children attacking activists Imad Abu Shamsiya and Yaser Abu Markhiya. The two men were attacked as they were recording on video the settler's aggressive acts against Palestinians in the neighborhood. The video release also showed a number of Israeli soldiers watching and guarding the settlers during their assaults. In a previous incident, Jewish settlers had threatened Abu Shamsiya to burn him alive after he videotaped one of them killing a Palestinian citizen called Abdul-Fattah al-Sharif in the same neighborhood on March 24. The Israeli Defense Ministry, in coordination with leaders of Israel’s right-wing settlement movement, is set to establish a new settlement adjacent to the already-established settlement of Shiloh near the northern occupied West Bank city of Nablus for 40 families living in the Amona outpost, following an Israeli Supreme Court decision to demolish the post by the end of this year. The new settlement is expected to be comprised of 139 housing units, with settler leader Zeev Hever planning to sell at least 90 of the new units on the open market, Haaretz reported. The building of the new settlement is seen as direct resistance to the Israeli Supreme Court ruling in 2008 that ordered Amona's demolition after eight Palestinians from neighboring villages -- with the support of Israeli human rights organization Yesh Din -- successfully petitioned the court to remove the outpost on grounds that the construction was carried out on privately-held Palestinian land. While the court decision found the Amona outpost to be illegal, all Israeli settlements in the occupied West Bank are illegal under international law. In 2010, the Israeli Supreme Court issued an injunction on the Israeli government demanding an explanation as to why no steps had been taken to begin the demolition of the illegal outpost. The Amona outpost also received demolition orders after rulings by the Israeli Supreme Court in 1997, 2003, and 2004, according to Haaretz, demolishing only nine structures in 1996. A spokesperson for Israel's Ministry of Defense could not immediately be reached for comment. 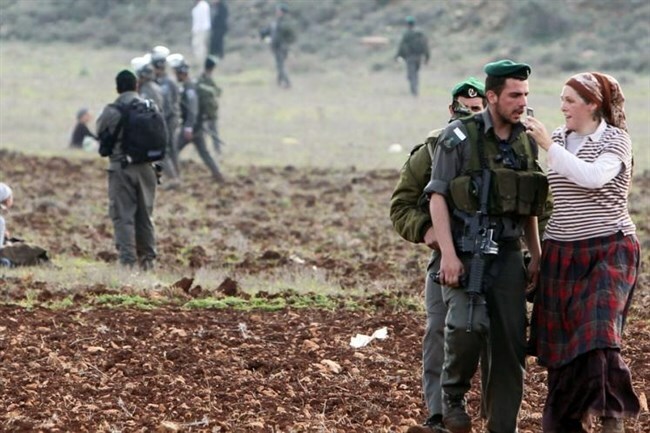 The Israeli authorities in April delivered notices to a Palestinian village in the Nablus district, alerting residents that 5,000 dunams (1,250 acres) of private land were slated for confiscation in what appeared to be the retroactive legalization of illegal outposts in the area. PA official Ghassan Daghlas told Ma'an at the time that some 12 illegal settlements and 27 settlement outposts are located in the Nablus district, housing around 23,000 of the "most extremist settlers in the Palestinian territory." In July, a settler from the illegal Adei Ad outpost -- among the several outposts retroactively legalized in last month's land confiscation -- entered the village of Duma and firebombed the house of the Dawabsha family. The attack killed Saad and Riham Dawabsha and their 18-month-old child. Israel has recently stepped up land confiscation in the occupied West Bank, with settlement watchdog Peace Now warning in March that Israel has not confiscated such large swathes of land for the purpose of settlement expansion since the pre-Oslo period in the 1980s. There are some 600,000 Israeli settlers residing in 196 illegal Israeli settlements in the occupied West Bank and occupied East Jerusalem, and a further 232 settler outposts, considered illegal both by international law and Israeli domestic law, according to the Applied Research Institute - Jerusalem (ARIJ). 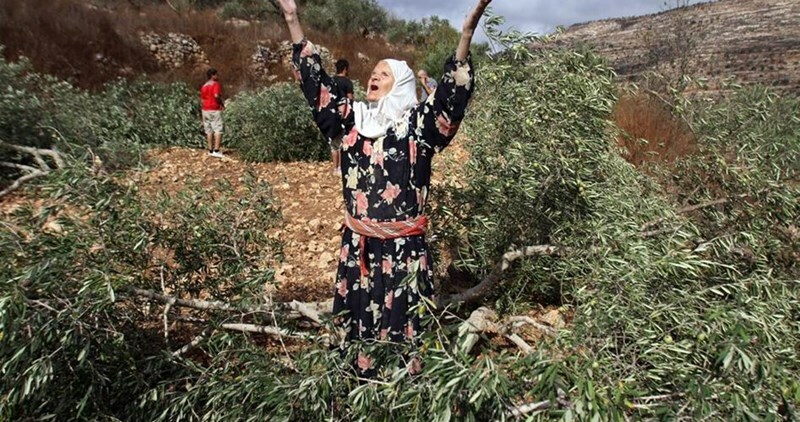 Israeli settlers labeled hundreds of Palestinian-owned olive trees in Deir Estia town west of Salfit as a prelude to cut them down. Local farmers were surprised Saturday morning when they found their olive trees labeled as a prelude to cutting them down to pave the way for expanding nearby settlements. The local activist Khaled Maali said that Deir Estia town has been for long a victim of numerous settlement expansion plans under flimsy pretexts. He pointed out that Israeli occupation authorities plan to confiscate Wadi Kana, which covers an area of more than 12,000 acres, for settlement expansion. The Jerusalemite family of Shafiq al-Khayyat on Thursday regained their home after being taken over for 20 months by Elad settlement society in September, 2014. Wadi Helweh Information Center quoted the family’s lawyer Medhat Dibe as saying that the decision was taken after several court sessions. At the end of March, the Israeli Central Court ruled that settlers had to evacuate the house immediately. The lawyer revealed that the court rejected the appeal of Elad society which means that the evacuation order is a final decision.